Dozens of EMBA alumni gather for their all-class reunion. A group of EMBA alumni with AKSOB faculty and LAU leadership. 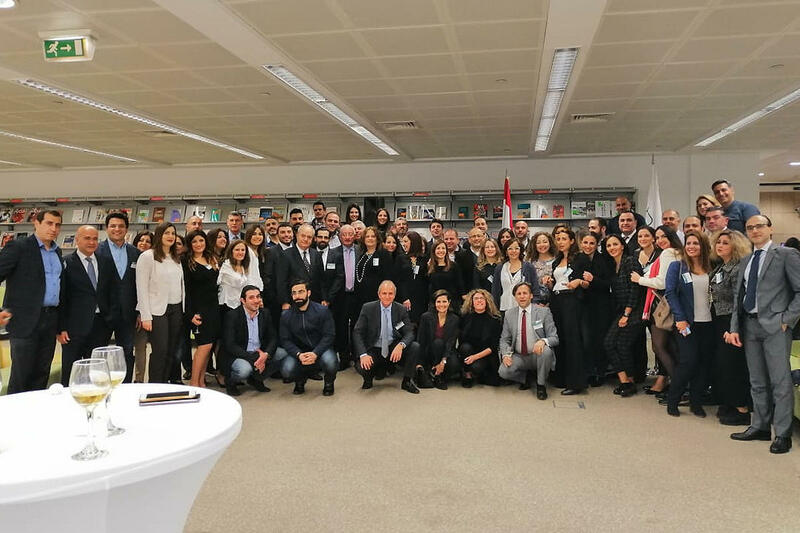 Dozens of graduates of the Adnan Kassar School of Business’(AKSOB) Executive Master of Business Administration returned to Beirut campus for their all-class reunion Friday evening. LAU blazed a trail when it launched its EMBA in 2000, the first university in Lebanon and the Middle East to offer such a degree. Since then, its 260 graduates have gone on to rise in corporate, public and non-profit organizations. The program’s students have come from all walks of life, including law, science, pharmaceutical and business backgrounds. Classes are given at LAU’s Executive Center@Solidere in Beirut’s scenic downtown and are offered on evenings and weekends for those who are holding down jobs during their studies. Earning their EMBA has helped alumni advance in their careers, and shift to completely new industries. After Rachid Moubarak completed the degree in 2006, he rose within his company to become vice president, and also co-founded a separate firm. “When you are a professional, you don’t see the whole picture. The EMBA helps you see the social, marketing and commercial aspects of business,” he said. For Roger Tanious, his EMBA not only helped him rise in his career but also start a new profession on the side. After earning his degree, Tanious advanced to the role of general counsel at his industrial firm. But he also introduced Aychak Man, a character he makes sculptures of. He has done 93 international exhibitions and credits his EMBA with helping him turn his hobby into an exciting art career. Many of the alumni present were taught by Dr. Wassim Shahin, now the interim dean of AKSOB, who welcomed them back to campus. “We are so proud of what you have become,” he told the crowd.